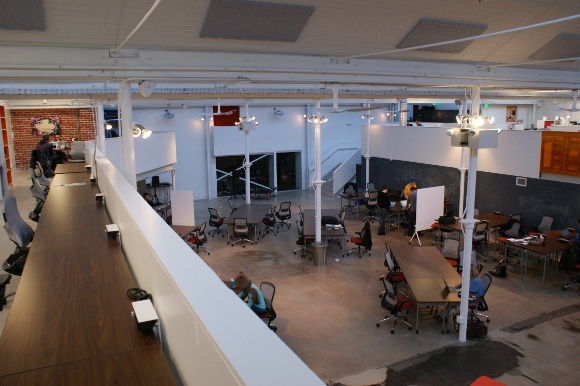 A view of Galvanize Golden Triangle's Atrium from above. This is the first in a series of features covering a workday at one of Denver's many coworking spaces. Wednesday Feb. 20, about 9 a.m. I arrive at Galvanize, the unmistakably kickass, startup-centric coworking space in the Golden Triangle's historic (1929) Rocky Mountain Bank Note Building, and check in on an iPad and wireless keyboard. Lilah gives me a visitor's pass that opens the door into the main Atrium, an open space full of ergonomic furniture and surrounded by equally ergonomic workstations and office suites. I go inside. About 15 people are quietly working below at the "hot seats," roving desks for $299 a month, a price that includes coffee, access to a small onsite gym and a place to work. Tenants can upgrade to permanent stations ($449 a month) and office suites (inquire within). The chatter builds. Cell phones ring. I make calls and slog through a few interviews. I doubt I'm going to be able to focus enough to write in this envirronment. About 30 people are working at the hot seats in the Atrium. My coffee is empty. I try to get coffee in the kitchen but the pot is dry. I'm confronted with a difficult-looking drip bar by Galvanize tenant Ninety Plus Coffee. "It's a pain point for me," says a goateed guy. "It's nice if it's made, but if it's not, you gotta got through this whole operation." There is a long list of detailed directions on the wall. I decide to not try. I briefly discuss the last 20 years of Northwestern University football with Galvanize Managing Director of Venture Capital Chris Onan. Galvanize Founder and Managing Director Jim Deters buys me a cup of coffee and a bagel at Gather, the resident coffee shop, bar and eatery. I ask him about his daily routine. "I get bounced around all day, helping this company with this introduction or helping that company with that introduction. My day is connecting and supporting entrepreneurs, and that is a f#@king cool life. I couldn't think of a more fun job." Deters tells me he's looking to expand gSchool, launched in Denver in January, to other cities while broadening the curriculum into mobile and UI. "Our current eyes are set on New York but I'm not sure," says Galvanize's Jim Deters of a new Galvanize location in 2014. He's opening another Denver Galvanize on Platte Street in the Central Platte Valley by Q1 2014 and a Boulder location in 2015. Deters also says he wants to open one in another city in 2014. "Our current eyes are set on New York, but I'm not sure," he says, pinpointing Manhattan. Another target could just be Austin, Deters' former home and where Galvanize is co-sponsoring a Colorado event at SXSW 2013. "We're looking at making Denver our major epicenter for curriculum," says Deters. "Denver creates his special energy you don't get in a lot of places." In other cities, a gSchool expansion "could move ahead of a full-blown Galvanize facility," he adds. Back in Denver, Deters says the first four months in Denver are exceeding expectations, with 68 companies and 250 people working at Galvanize, ranging from one-person operations to 20-person companies. "We want to take startups through the lifecycle," says Deters. 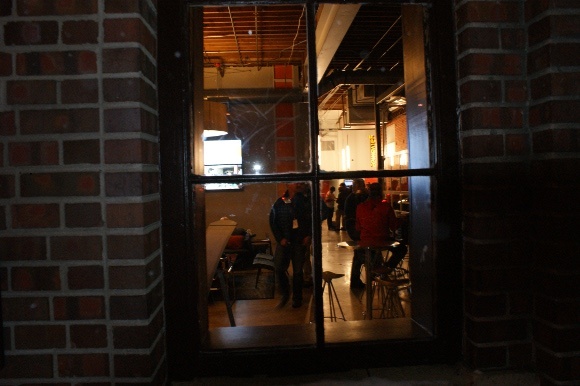 "That's what makes us different than other coworking spaces: We want to build badass companies." Capital is one of Galvanize's four Cs -- community, curriculum, and (unofficially) coffee, says Deters, and the first Galvanize VC will close its first fund in March. "This whole idea stemmed out of wanting to be a better venture capitalist. We're trying to make a startup's life as productive as we can." Community centers on Gather, where there are Tuesday "Pitches and Pitchers" events and a killer grilled mac and cheese, says Deters. "Come and watch the tech entrepreneurs in their natural habitat," he carnival-barks, adding that it is "literally the spot in town to run into venture capitalists" and tech entrepreneurs. On cue, NewsGator Chairman J.B. Holston enters, followed by iGiveFirst Founder Sharif Youssef. I ask Deters about the coffee operation. "Ninety Plus actually has the best coffee in the world," he says. I guess I'm going to have to buckle down and do this thing. A startup congregates over pizza on the couch. I take another call. The Atrium from above. I have a face-to-face interview Mike Biselli of MedPassage, a Galvanize tenant. I need to figure out this drip bar. I follow the directions, grinding and weighing 24 grams of beans, then gradually filtering 350 grams of hot water through the coffee. As I work, I talk to Alex Novoselsky, a developer with Galvanize tenant RentBits. "It's way better than our old offices in DTC," he tells me. "We used to walk down long hallways and see nobody." I painstakingly complete the drip operation and have about twelve ounces of damn good coffee. Working in public quiets my cursing. "It's way better than our old offices in DTC," says Alex Novoselsky, a developer with Galvanize tenant RentBits. "We used to walk down long hallways and see nobody." I speak with Blair Anderson, a gSchool student from Seattle. "There are only three programs like this in the country," he says. "I sold everything and came out here with a carload." His evaluation after the first three weeks: "I love it. I want to come in." I make more calls. I say hello to my friend Adam Rentschler, CEO of ValidEval , who tells me about Galvanize tenants Brandfolder and Simplur. I write. I've got 364 words. Not bad. DeVotchKa plays quietly in the background. My coffee is long gone. I don't need any more. I talk to Closely CEO Perry Evans. about working here. "The team finds it very energizing," he answers. "A friend of mine says, 'Being an entrepreneur is a lonely life.' So this is a lonely hearts club for entrepreneurs." Back to writing, I aim for a day's total of 700 words by 5 p.m. and beat it with four minutes to spare. Maybe I could actually function here. "When you have a home office, you're very efficient, but you miss out on other people," says Galvanize-based Energy Consultant Rich Krauze. "There's a buzz here and it gets your juices flowing." I start to pack up, striking up a conversation with energy consultant Rich Krauze, a hot seat occupant who lives in an adjacent apartment building. I ask him why he works at Galvanize. "We have a four-month-old at home -- he kicked me out," he laughs. Getting serious, he adds, "There's people. When you have a home office, you're very efficient, but you miss out on other people. There's a buzz here and it gets your juices flowing. You can lose a little focus, but it's inspiring to talk to other people. It keeps you on your game." Gather, Galvanize's resident coffee shop and bar. I'm having a pint of Great Divide at Gather. Words and photos by Eric Peterson.